This entry was posted in Christmas, Food, Recipes. Bookmark the permalink. Excellent improvising Wendy! I love creme de cassis but cranberry is a lovely festive twist. I have been meaning to start making cocktails at home, tks for tip, Wendy! What a good idea! And we can tell ourselves that it’s a “healthy” cocktail. Fantastic idea! Cranberry’s so good for you that I almost feel it’s my duty to make these cocktails ; ) I remember your telling me a little about that night in Paris when I made Creme de Cassis earlier in the year, and I remember what you said all the time. It sounds like the most magical night – I even tried to get my husband over there for New Year’s this year! I must have had your story in the back of my mind. Beautiful little red orbs you have there, Wendy. Great cocktail idea. I’ll be holding you to that Hogmany festival. Sophie – Thought it might be prudent to keep this particular technique to myself! Amanda – It was a magical night. Always makes me smile when I think about it! Lucy – Why, thank you. 🙂 Will keep my promise. Sounds yummy! And I still have a few of my treasured cranberries left! Katie – I always find it oddly stressful when I only have a little of something left thinking: what is the best way to use it?! What a great idea – cranberry syrup! 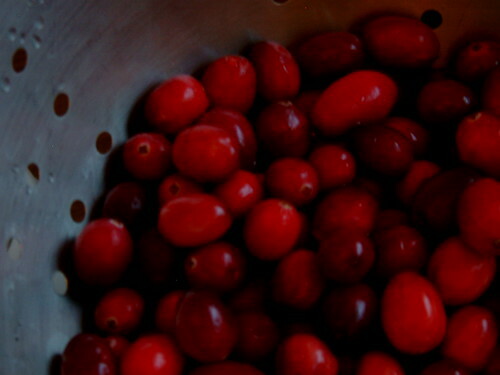 I love cranberry things, and I’m going to make the syrup and the cranberry royale. Merry Christmas!